This delightful pair of CDs contains music from three collections published in northern Italy between 1610 and 1641. The earliest is a volume published in Milan in 1610, Concerti ecclesiastici, which is made up of music by the two brothers Giovanni Paolo Cima and Andrea Cima and contains the ‘Sei sonate, per instrumenti à due, tre e quarto’ recorded here; the next, chronologically speaking, is the Madrigali, libro II of Francesco Turini, published in Venice in 1624, from which six sonatas for two violins and continuo have here been extracted. The last is another Venetian publication (of 1641) the Sonate a 12.2.3. per il violono or cornetto, fagotto, chitarone, violoncino o simile altro istrumento of Giovanni Battista Fontana. The two Cimas were both organists in their native Milan, composing both sacred music and instrumental music. Giovanni’s work, more clearly than that of his brother, registers that crucial development in the early baroque music if northern Italy, the movement away from polyphonic textures towards solo (or due) melodies supported rhythmically and harmonically by a continuo bass, or to put it another way, the movement in which the usually polyphonic canzona gradually lost ground to the sonata. Eleanor Selfridge-Field (Early Music, February 1991) has shown that most organist-composers of the period were largely given to the composition of canzone rather than sonatas, but Giovanni Paolo Cima is an exception. The published scores of Cima’s sonatas are quite specific as to instrumentation, foregrounding the cornet and the violin as soloists. Andrea Cima’s instrumental music included in the 1610 collection is closer in structure and method to the declining form of the canzona, and the presentation on this CD of work by both brothers enables one to see (or rather hear) the nature of the transition which was taking place. Turini’s sonatas belong very much to the new development of the sonata; indeed they are amongst the earliest examples of the trio sonata. Turini is an interesting figure, a an innovative and accomplished composer. Of Italian stock, he was born in Prague and became court organist there at the early age of 12; he was sent to Italy to study, returned to Prague at least briefly, and then from the late 1610s made his living in Italy. From 1620 he held the post of organist at the cathedral in Brescia. His publications included three volumes of madrigals – with parts for violins - in 1621, 1624 and 1629; his other publications included volumes of motets (1629 and 1640) and a set of masses (1643). The sonatas included here are fine works. The Sonata a 2 violini, which opens the second CD, is a piece of exquisite beauty, subtle melodic twists and changes of direction, quiet yet vivacious; the use of chitarrone alongside the harpsichord to provide the continuo, a practice which Turini himself advocated, produces some beautiful effects. Turini’s set of variations on the song ‘E tanto tempo hornai’ is thoroughly engaging, inventive and delightfully varied in instrumental colouring in this excellent performance by Ensemble Sonnerie. The greater part of this set is given over to all eighteen sonatas printed in Giovanni Battista Fontana’s 1641 posthumous collection – born in Brescia, Fontana had died around 1630, possibly a victim of the dreadful plague which affected northern Italy between 1629 and 1631 and which claimed the life of so many musicians (including Giovanni Paolo Cima). 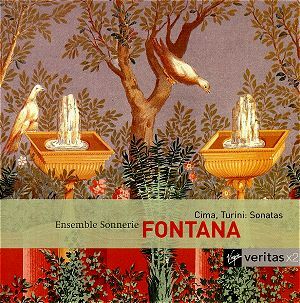 We cannot know whether the designation of these sonatas as for il violono or cornetto, fagotto, chitarone, violoncino o simile altro istrumento is Fontana’s own or was the work of a later editor or publisher. According to Selfridge-Field this was the earliest such volume to specify the use of the violoncello as part of the continuo instrumentation. Fontana’s sonatas are here played so as to make use of the kind of variety of instrumentation which the 1641 title page allows, perhaps even encourages. No.1, for example, is played by cornet and organ alone, while no.2 uses violin, harp, chitarrone, lirone and virginals; no.9 is played by cornet, dulcian and organ, no.18 by violin, cornet, dulcian, organ, harp and chitarrone. The resulting variety of colours and dynamics is a constant source of aural pleasure; the performers’ choice never seem merely wilful or eccentric, but to respond to the nature of the music in each particular sonata (which isn’t to say that other choices might not be made by other performers or, indeed, by the same group on different occasions). Ensemble Sonnerie’s playing throughout is the height of sensitivity and aptness; while based on sound historical scholarship it is never remotely pedantic. The performances, by soloists such as Monica Huggett and Bruce Dickey, and by the ensemble as a whole, are full of an obvious, but never indulgent, love of the music. The whole project has a distinctive air of Lombardy and Venice about it – the relishing of instrumental colours, the evident sophistication, the sensuality, remind one irresistibly of north Italian painting of the same (and slightly earlier) generations. These CDs provide an exemplary illustration of the north Italian emergence of chamber music. But to say that runs the risk of making them sound merely like worthy historical documents. But they are so much more than just that – the first adjective I used at the beginning of this review was “delightful”. It deserves to be one of the last, too; these CDs will be a source of great pleasure to anybody with an interest in the instrumental music of the early seventeenth century.